My almost-two year old has recently taken a major interest in bunny rabbits. (And who could blame her – they’re the cutest!) We have a bunny rabbit that lives nearby our home, and usually in the late evening we’ll find him outside nibbling at the grass under the big tree in our yard. Every time my daughter sees it, her smile is bigger than the moon itself! All of this is perfect timing, too, because Easter will soon be here! The shelves at the stores are overflowing with the cutest spring decor, and every time my daughter spots a bunny rabbit she gets downright giddy! With all of the spring time activities and functions going on this month, I knew I needed to come up with a quick, fun and festive dish that I could easily throw together that both kids and adults alike would love. Any time I need to spring for something quick and easy, RITZ Crackers are always one of the first things that come to my mind. When it comes to pleasing a crowd, there’s nothing better (or easier) than making a delicious dip paired with RITZ Crackers for everyone to enjoy! 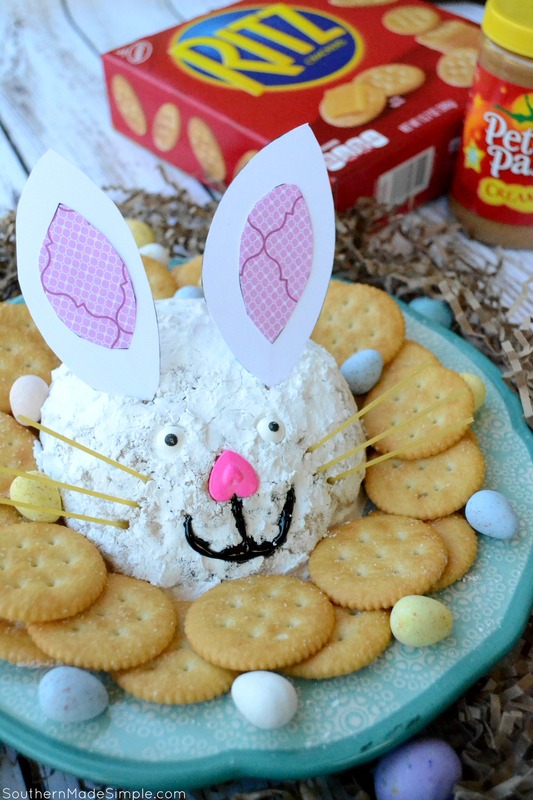 Pulling the inspiration from my daughter’s new-found love for bunnies and by RITZ Crackers being the perfect snack for any occasion, my plan to make an Easter Bunny Peanut Butter Cheese Ball was born! 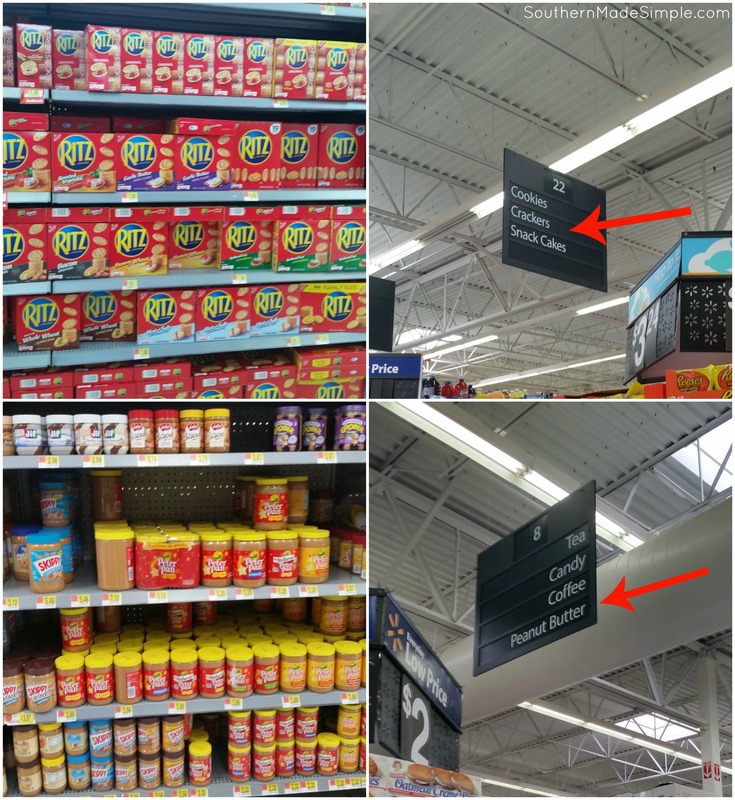 Earlier this week I headed out to my local Walmart to stock up on a few things I needed to make the Easter Bunny Peanut Butter Cheese Ball. RITZ Crackers are a staple item in my pantry, so I always make sure I grab a box when I’m grocery shopping! I also made a pit stop by the peanut butter aisle to pick up a jar of Peter Pan® Creamy peanut butter – which is a key ingredient in this cheese ball to give it that perfect, creamy and peanutty taste! As I was unloading my groceries when I got home, I had to stop and fix myself and my daughter a little mid-morning snack. I was instantly taken back to the days as a kid after school when I would spread a little peanut butter on top of RITZ Crackers and place a slice of banana or cheese on top. Dee-lish! It reminded me of how truly versatile RITZ Crackers are. 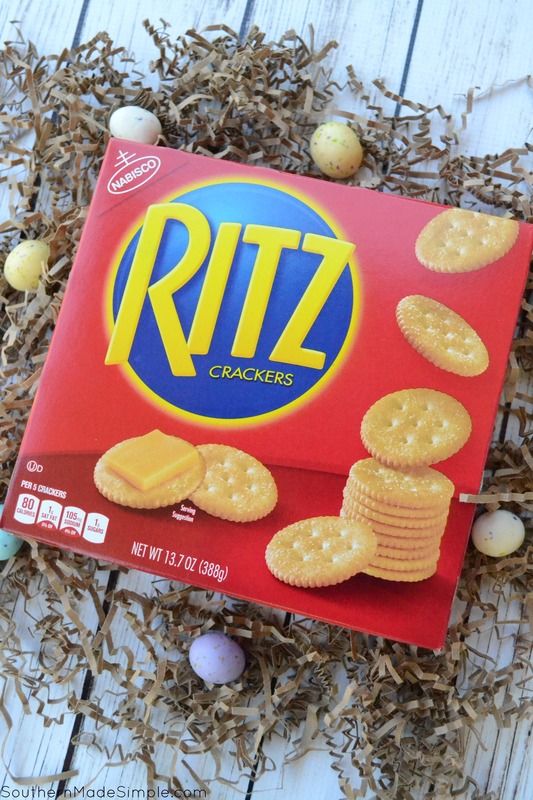 That snack was just the thing I needed to give me a boost of #RITZpiration to help me prepare our Easter Bunny Peanut Butter Cheese Ball! I combined a package of softened cream cheese, Peter Pan® Creamy Peanut Butter, powdered sugar, brown sugar and white chocolate chips using a mixer. 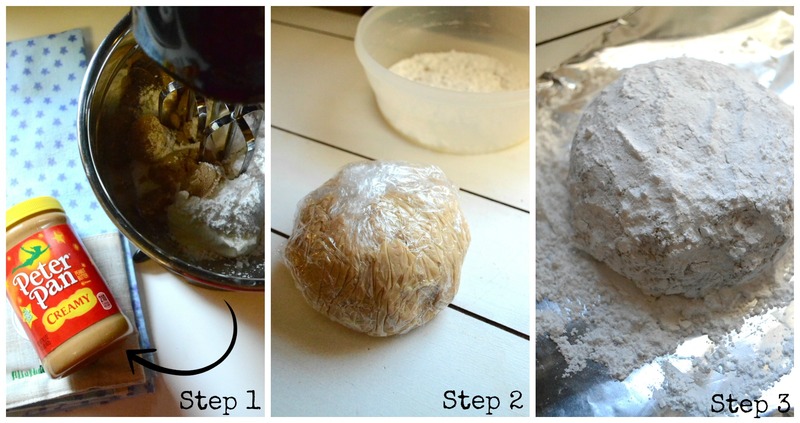 Once the ingredients were well combined, I transferred the mixture onto the center of a large piece of plastic wrap. I covered the mixture, formed it into the shape of a ball and placed it in the freezer for an hour and a half. I then removed the plastic wrap from the ball and patted additional powdered sugar all across the outside of the ball with my fingers to form the body of the bunny. Combine cream cheese, Peter Pan® Creamy Peanut Butter, powdered sugar, brown sugar and white chocolate chips in a bowl and blend using a mixer. Tip: Use an extra spaghetti noodle and tape it to the back of the bunny ears to help them stand up straight! I free-handed the bunny ears on some card stock and scrapbook paper I had laying around. To make them stand up securely, you can tape a toothpick to each one and insert into the cheese ball. I used spaghetti noodles for the whiskers, candy eyes, food gel coloring for the mouth and a heart shaped candy (found in the cake decorating section) for the nose. 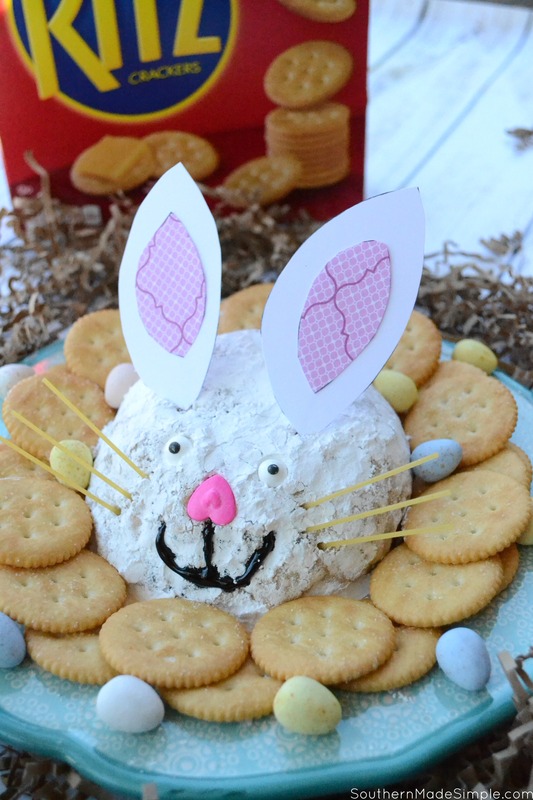 I centered the little bunny on one of my favorite spring colored plates and began arranging the RITZ Crackers all around it so friends and family can dig right in! 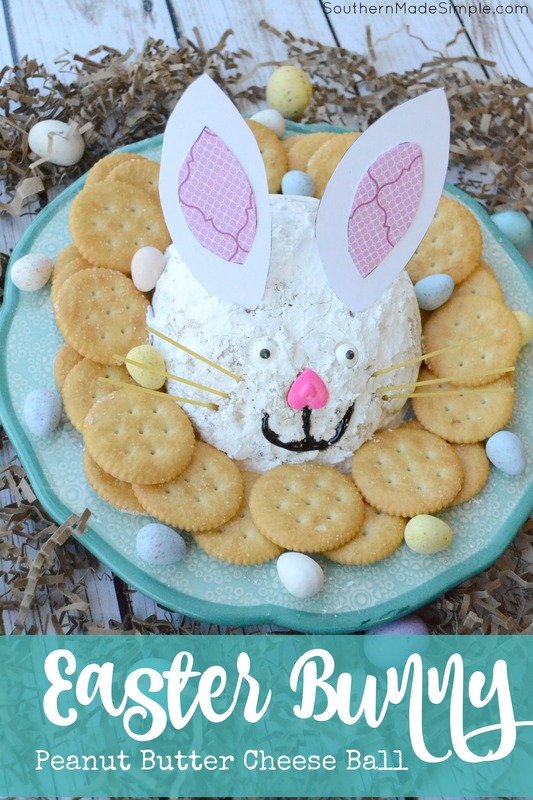 I’ve eaten many a RITZ Cracker in my day, but I don’t think I’ve ever had so much fun eating them as when I get to share them with my bunny-crazy kiddo while digging in to this super scrumptious little cheese ball! They’re the perfect compliment to pair with the Peter Pan® peanut butter inside! For more recipe ideas and inspiration, just come on over and spin the wheel and have fun joining in on the #RITZpiration! Previous Post: « Spring Cloth Diapers and Accessories from Lil Eco!